I'd been looking for a Puligny-based producer for over 10 years - the superstars are already taken (and savagely expensive), and most of the also-rans just don't cut it for me. Then in the fall of 2017 Switzerland-based wine writer Bill Nanson (The Burgundy Report) turned me onto tiny Domaine Albert Joly, and I finally hit paydirt! The Joly estate totals just 11 acres, all of which is in Puligny. Nearly half of their holdings are in the Bourgogne appellation, with the balance being Village-level parcels. Sadly they have no 1er or Grand Cru. Based on what they achieve with their "humbler" holdings I'd love to see what they'd do with a piece of Chevaliers or Caillerets! 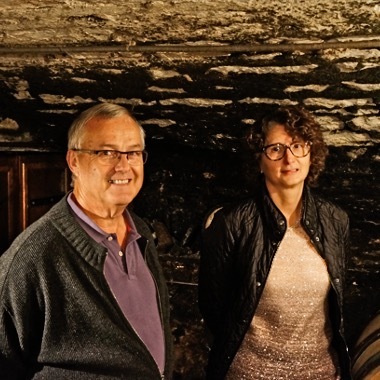 Sylvie Prevot-Joly took over the estate from her father Albert in 2007, and started estate bottling at that time. Working together with her brother-in-law Gilles, she still sells 80-85% of her fruit to negociants, so the production under the Joly label is quite limited. That will surely change as the reputation of the domaine starts to gather some well-deserved steam. They produce pure, classic Puligny - crisp whites with supple fruit and great energy and a purity of precision and minerality that could only come from Puligny. The Joly cellar (yes, it's an actual cellar - of which there are very few in Puligny, due to the high water-table in the village) is just below the village and a couple of stone's throws from the Hotel-Restaurant Le Montrachet, but there is no sign or anything indicating that there are some gorgeous wines hiding underneath the non-descript stone house in the middle of the vines. I definitely passed it up a few times thinking I must have been lost, until I finally pulled over and rang the bell. Sometimes the best things come are hiding in plain sight!